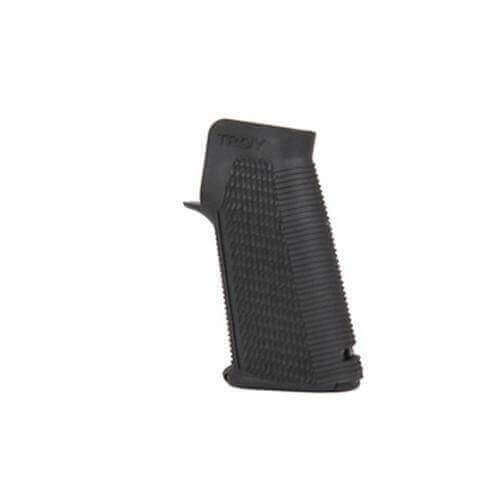 Excellent ergonomics and the superior strength of rugged advanced military grade polymer shape the Troy Battle Ax Pistol Grip. Refined angling sets your hand close to the receiver and leads your arm and shoulder into a high-comfort, high contour zone. Shortened length ensures you get a perfect grip every time. Aggressive scale pattern keeps the shooter’s hand in place. Fits M4, M16/AR15 and FN SCAR rifle Made in the U.S.A. This is my second Troy grip. The first went on a pistol caliber carbine and, I really liked the way the grip felt when changing magazines. One of my other ARs was biting my middle finger, at the gap where the trigger guard attaches, during magazine changes. I had finally had enough. Yeah, I could have just worn gloves but, I ordered another Troy grip instead. Problem solved and, gloves not necessary. Thanks for sharing your feedback, Michael. We're so glad you're satisfied with your purchase. Cheers! Researched many grips and found this one. Great company with good prices and fast shipping. The grip turned out to be exactly what i wanted and feels great with or without gloves.